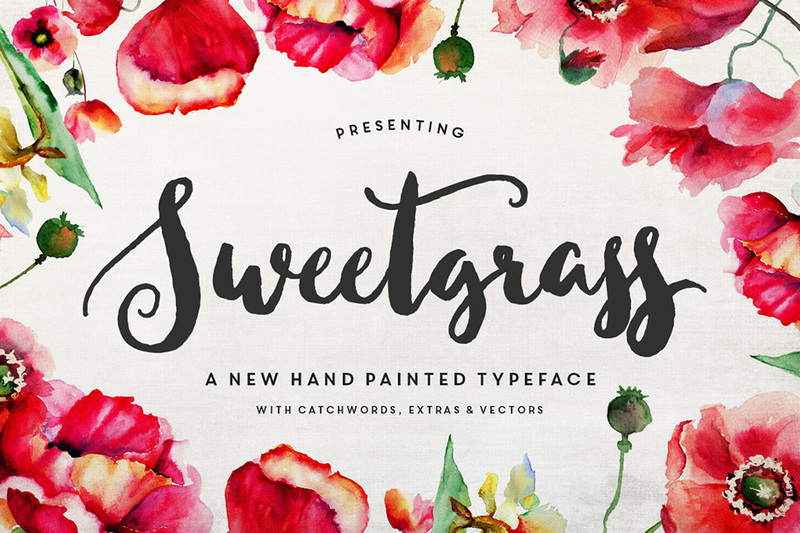 Meet Sweetgrass! A delicate, hand painted typeface with an ‘unfonty’ feel. Want to give your projects that organic, hand-painted look? Well, I’ve included plenty of ends, alternates and extras, so that you can do just that! Sweetgrass looks lovely on wedding invitations, greeting cards, logos, business cards and more! • 100 Hand-Painted Botanical Vectors (.AI, .EPS & .PNG). Drop in your own color and layer them, to create your own unique floral arrangements (example under character preview). • Bonus: 20 of my favorite Photoshop watercolor patterns. Please note: This is a .PAT file, which will only work in Adobe Photoshop. • Links to the watercolor flowers are listed in the FAQ section. File size is approx 39.3MB (56.8MB unzipped), offered as a single download.